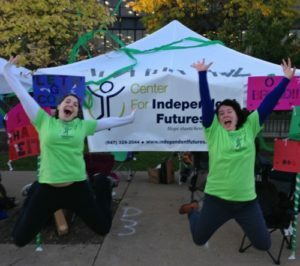 2018 was a big year at Center for Independent Futures! From fun and glamorous events like SPARK to meeting new people at conferences around the country, this last year held a lot to be celebrated. Join us in remembering our top 10 moments of 2018! Club 21, a California non-profit, asked us to present at their Tools For the Journey conference. It was exciting to get out of the chilly Midwest for a few days to share our tools & resources with the Club 21 community. We conducted a meet and greet session with Highland Park community members in March. Since then, we have started including the village in our activities calendar through monthly Gab and Grub dinners. It is exciting to meet members of new communities, and we can’t wait to continue! In April, our annual gala event was a shining evening! Join us again this year on April 26th at the Hilton Orrington! We will have more live entertainment, the annual Awesome Awards, delicious food, and wonderful auction items for all. A group of Bike Club members participated in Bike the Drive again this year! They raised almost $7,000 through their fundraising efforts and had a good time biking in the cloudy weather. We can’t wait for next May to ride Lake Shore Drive again! 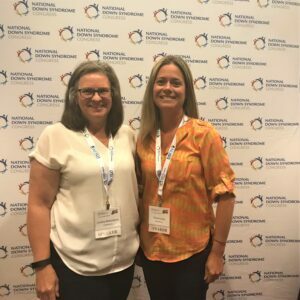 Chrissy & Cynthia went down to Dallas, Texas, in July to present at the National Down Syndrome Conference. They rocked the presentation and made new connections! We appreciated having this opportunity to present to industry experts and families alike. Our schools team hosted the annual Life Skills Camp in mid-July, in addition to a new summer camp opportunity. Thanks to the Evanston Community Foundation, we were able to provide a Transportation Camp for Evanston Township High School transition students. On a rainy Sunday, 18 members of Team CIF completed one of the greatest challenges: completing 26.2 miles throughout the neighborhoods of Chicago. Thanks to our community and team, we raised over $16,000 through the Bank of America Chicago Marathon! At our housing conference in October, we shared our New Futures Initiative and housing resources with over 100 people dedicated to change. We are thankful for each of our presenters, including our panelists, endnote speaker, and keynote speaker, Micaela Connery of The Kelsey. Watch for video of the day coming soon! 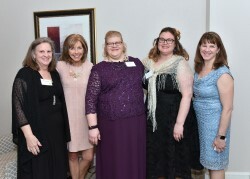 We ate to our hearts’ content at the Woman’s Club of Evanston in early November. Thank you to the 25 wonderful food, dessert, and beverage sponsors for supporting our annual fall favorite! We hope to see you all next year! Thanks to all of you, we surpassed our $20,000 #GivingTuesday goal! We also met the requirements to receive the full $10,000 match from the Coleman Foundation. That means we raised a total of over $34,000 with your help! We are deeply grateful for our caring, generous community after such a big year! 2019 looks like it will be even bigger, so we hope that you will continue on this journey with Center for Independent Futures. 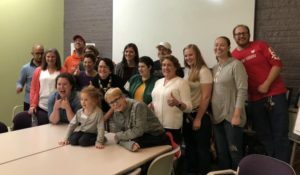 If you would like to be part of our story, sign up for our monthly newsletter today and make a year-end gift to support inclusive communities in Evanston! On October 13, 2019, thousands of dedicated runners will line up at Grant Park, ready to take on the Chicago Marathon course. 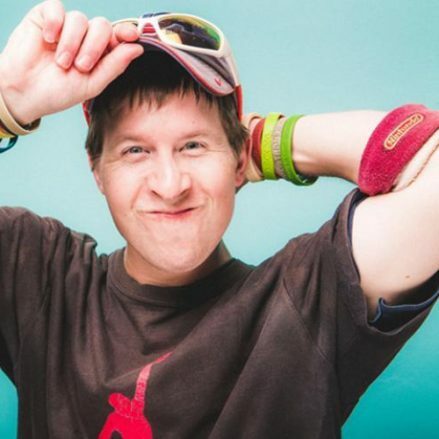 Out of the thousands of runners, there are hundreds of generous marathon participants who sign up for guaranteed entry by choosing to support a charity team. 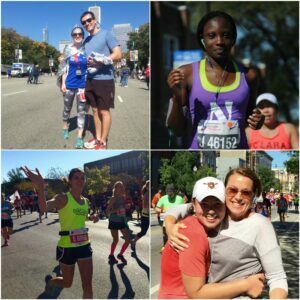 We have put together a frequently asked questions blog about our Chicago Marathon team. If you’ve ever thought about running a marathon — or know someone else who has — take a look! Even if this opportunity isn’t for you, please help us spread the word! Forward this blog to your friends, family, and coworkers to let them know about this chance to be part of a Chicago tradition. What is the Chicago Marathon? The Bank of America Chicago Marathon is an opportunity for runners around the world to achieve a remarkable feat: running 26.2 miles through many of Chicago’s unique neighborhoods. Runners sign up in late October and November, and then they train hard to complete the course in under 6.5 hours. Can My Family and Friends Watch Me Run? Of course! There is room for spectators along the whole course, but Mile 15 is really where the party’s at. At Mile 15, there is the Charity Block Party, where cheerleaders from charity partners like Center for Independent Futures will be waiting to cheer on our team — and all the other runners, of course! Your friends and family are always welcome to join us at the block party! 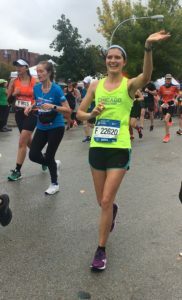 At Center for Independent Futures, we only ask that our Team CIF runners meet the minimum fundraising amount required by the Bank of America Chicago Marathon organizers. That means each runner will be asked to raise $1,250 to support the hopes and dreams of individuals with disabilities. What Team Supports Do You Offer? When you join Team CIF, you are becoming part of a community. We will help you every step of the way from working on individualized fundraising ideas to helping you remember important steps. Plus, you will have the chance to join the Chicago Area Runners Association at a discounted rate because you are running with us. It’s easy! Just email team coordinator Connor Larsen and let her know you want to join the team! She will walk you through the two-step registration process and make sure you are registered to the team. 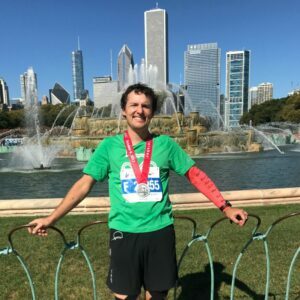 Then Connor will help you get set up with fundraising tools and training tips throughout the following year to make your Chicago Marathon course successful. Don’t wait to claim your spot – there are only 15 left! Congratulations to Chicago Marathon Team! About a year ago, eighteen members of our growing community signed up for the challenge of a lifetime: running the Chicago Marathon. On Sunday, October 7th, our charity team completed this challenge, bringing home their medals and accomplishments. 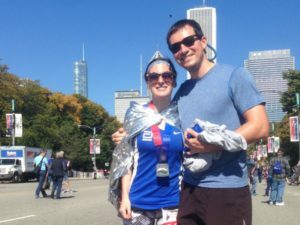 The Bank of America Chicago Marathon charity team raises funds for their respective charities in return for guaranteed entry to the race, and Team CIF did not disappoint! On Friday before the race, we hosted a pasta party for our runners. Courtesy of Olive Garden at Lincolnwood, the runners were able to fill up on pasta, breadsticks, and salad in order to carb load before the big day. Several members of the marathon team joined us, including some families, and we were joined by staff, Community Builders, and participants as well. We love hosting this pasta party for just this reason. It’s the perfect opportunity for the runners to meet our loving community and see who their fundraising supports. On Sunday, while the team got ready to run, six participants and a few staff members got ready to cheer them on! We set up a tent and made signs for the runners on mile 14 along the Charity Block Party. As runners passed, we offered them carbs in the form of pretzels and mini bagels, plus sugary energizers like gummy bears. When our team members ran past, we cheered as loud as we could! It was a long, rainy day in Chicago, but we didn’t let that stop us from supporting our wonderful 2018 Bank of America Chicago Marathon charity team! Still Time to Contribute to Team CIF! The team set a goal of raising $1,000 per runner, and by Monday morning, they had raised $13,657! That’s 76% of the team’s $18,000 goal! But you can still help push them over the edge. The team has until November 30th to raise the last bit of their funds. You can donate to the team on their CrowdRise page. We also have one more team fundraiser this week! On Tuesday, October 9th, you can visit Potbelly from 5:00-8:00 to donate 25% of your purchase to Team CIF. 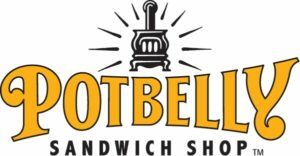 All you have to do is go to the Potbelly at 630 Davis St. and tell your cashier you want to support Center for Independent Futures. Always Wanted to Run a Marathon? You’re in luck! 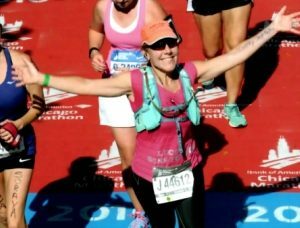 Team CIF has been granted another 18 slots for our 2019 Bank of America Chicago Marathon charity team! We walk our marathon team through each step of the process, including monthly check-ins throughout the year and tools for fundraising. Plus, you get access to our team pasta party, a group of folks cheering you on, and the opportunity to be part of this wonderful community. Contact Connor Larsen at clarsen@independentfutures.com or (847) 328-2044 to learn more. Of most common exercises, running can wreak the most havoc on a person’s body. As your feet strike the pavement, the shock of impact travels up your leg, affecting the delicate bones in your feet, putting stress on your knee joints, and invoking pain in your hips. But that isn’t stopping our team of 18 Chicago Marathon runners. 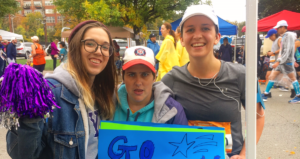 Mile after mile, our team members will be running for the hopes and dreams of individuals with disabilities who hope for a future where they can live independently. Our runners have been working hard all year to prepare for a 26.2 mile challenge. In the final stretch for marathon runners, they need your support. Help the team reach their fundraising goal of $18,000! This is our biggest goal yet, and our runners need your help! Go to CrowdRise and click the big red button on the right side to donate. You can also donate to individual team members by clicking on their name at the bottom of the page. Let our runners know they have your support! If you have run a marathon before, or if you want to share encouragement, let the team know. Reach out to Connor, and she will pass on your words of encouragement to the team. Knowing you appreciate their hard work and dedication may be the boost they need to keep going! Join us at the Charity Mile Block Party! 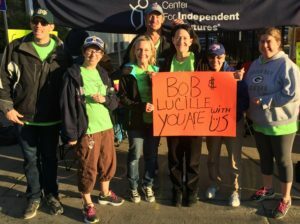 Cheer on the team with Center for Independent Futures participants, staff, and Board members as our runners pass Mile 15. The Cheer Team enjoys breakfast and camaraderie – let Connor know if you want more information about joining us at the Block Party. Ready to Join the Support Team? 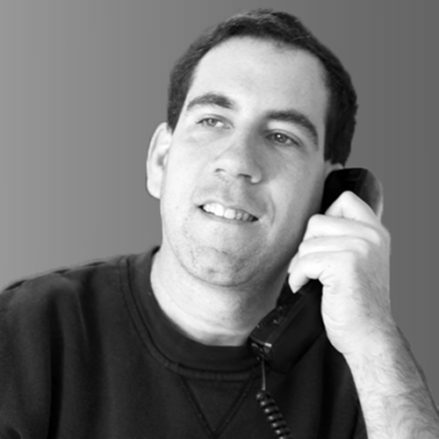 If you have any questions or ideas about supporting the final stretch for Marathon team, call the office at (847) 328-2044 or email Connor today! The Bank of America Chicago Marathon is coming at us fast! Our eighteen person team is busy training and fundraising their $1,000 minimum, but we want to help them as much as we can! So we are hosting two fundraisers at restaurants in Evanston! 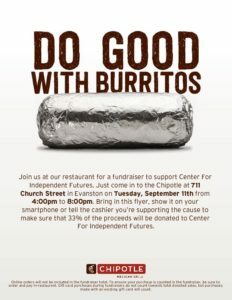 Read more for the details..
First up, visit the Chipotle at 711 Church St. in Evanston on Tuesday, September 11th! From 4-8 pm, you can buy dinner for yourself and your family or friends. As an added bonus, a whole 33% of the proceeds will benefit our Chicago Marathon team! Bring in your phone with this post to make sure the donation goes to Center for Independent Futures. Show the cashier this flyer, and they will take care of everything else! Then, on Tuesday, October 9th, Potbelly will be hosting a fundraiser to benefit the team just after the Marathon is over. 25% of the proceeds will be donated to our Marathon team’s efforts from 5-8 pm. Visit the location at 630 Davis St. to participate! Just mention the fundraiser, and you are all set! Potbelly will forward your support for our marathon runners! What Other Ways Can You Support the Team? Are you looking for other ways to support Team CIF? Check out this blog post where you can donate to our current team members, or put the Marathon on your calendar! We will be cheering on our runners from the Charity Block Party all morning, and we would love to have you join us! 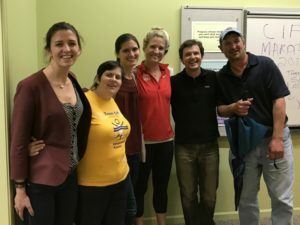 If you are interested in running the 2019 Chicago Marathon, let us know! We will be looking for team members starting in late October or early November. Want to find out more? Email Connor Larsen with your question, and she will get back to you as soon as possible. 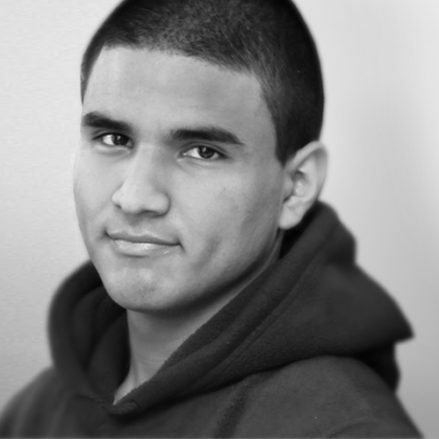 A familiar face many members of our community will recognize has an answer. Elizabeth Male began running at about age 10, and she completed her first half marathon in high school. She completed her first Chicago Marathon in 2012. This experience running leads you to believe she has always loved the sport, but Elizabeth used to hate running. It wasn’t until she was in college that she started to enjoy running. “When I ran in college, it helped me balance my mental health and de-stress from classes,” Elizabeth says. 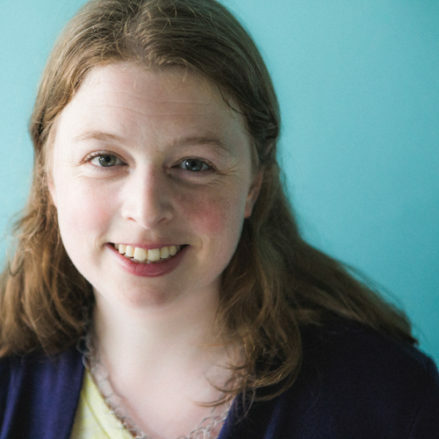 This will be Elizabeth’s sixth time running the Marathon, partly because she enjoys the challenge but also because of the community she has developed. 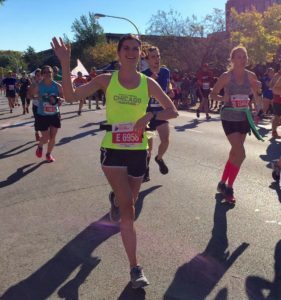 In 2014, Elizabeth ran the Chicago Marathon as part of Team CIF for the first time. The introduction of the lottery system meant she could secure guaranteed entry to the race by running for a charity. Luckily, Elizabeth had access to a great team at her fingertips. She took over planning for the team and decided to join the team to help with motivating other runners. One of the team’s most experienced runners, Elizabeth has advice for team members, plus anyone interested in joining next year. 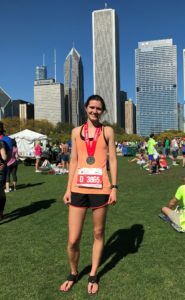 “The journey will be full of hard work, but it’s about achieving a challenging goal.” While having more experience running long distances might make this race less daunting, Elizabeth avoids falling into a trap by remaining motivated. No matter how many marathons she has run, Elizabeth needs to do the work like everyone else. At the moment, Elizabeth is training for a race in July, and then she will begin preparing for the Chicago Marathon. She is looking forward to the race, especially getting to the Charity Mile, where our core group of participants and friends will be waiting to cheer on Team CIF! 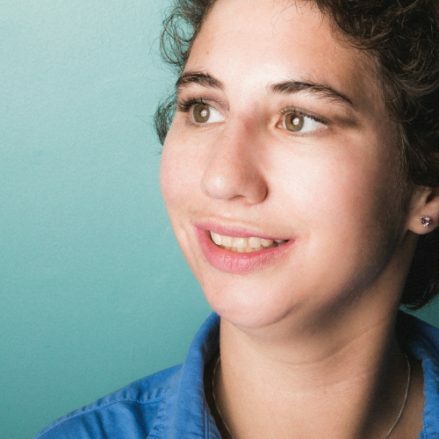 You can help Elizabeth meet her $1,500 fundraising goal by going to her CrowdRise team page and clicking the big red “Donate Now” button. If you are interested in joining the 2019 team, reach out to Connor Larsen at (847) 328-2044 or by email. It’s never too early to think about your own hopes and dreams! Have you ever dreamed of running a marathon? The challenge is tempting for many people, but especially for the 18 runners participating in the Bank of America Chicago Marathon for Team Center for Independent Futures this year. On October 7th, these runners will gather at Grant Park to run 26.2 miles — or a collective 471.6 miles. In the next four months, the runners on our team will be working hard to train safely. Training plans help marathon runners track their mile times, build endurance, and maintain a nutritious diet throughout preparation for the marathon. 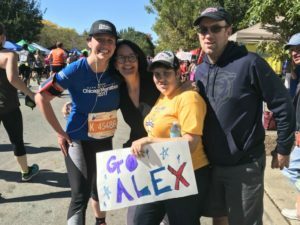 To help the runners prepare, you can support the team by helping them fundraise through their team pages on CrowdRise. 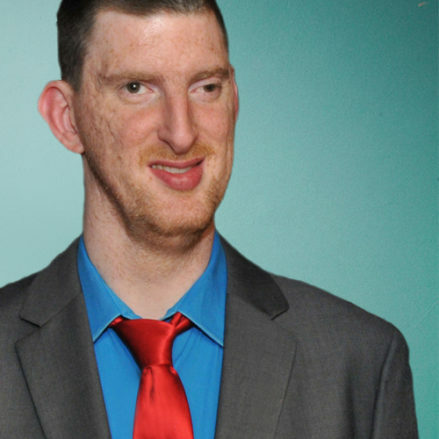 To donate, go to the Team Center for Independent Futures CrowdRise. You can select a specific team member, or you can donate to the general team page. Click the big red “Donate Now” button on the right side of the page to help the whole team, or click one of the runners’ names below to help a runner. 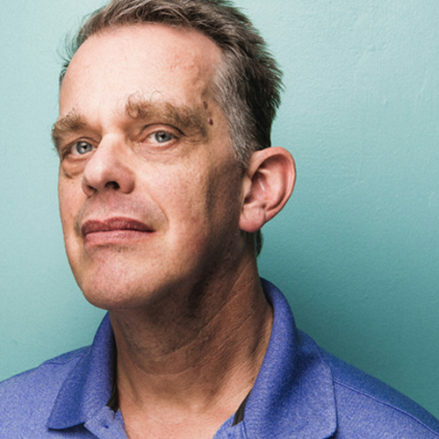 All of the funds raised by this team will help Center for Independent Futures continue creating innovative housing and planning solutions for individuals with disabilities and their families. Contact Connor Larsen or call (847) 328-2044 to learn more about supporting our Chicago Marathon team. Thank you for supporting Team Center for Independent Futures! Every mile of the Bank of America Chicago Marathon is a chance to test your strength and achieve a dream. For runners on Team CIF, those miles mean even more. 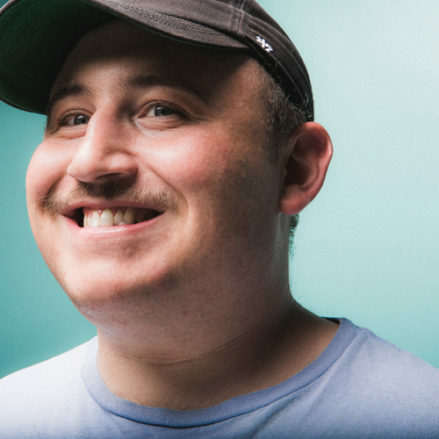 As an official member of the Chicago Marathon’s Charity Program, Center for Independent Futures offers guaranteed race entries for runners who pledge to raise funds and awareness for individuals with disabilities and their families. Since 2007, Team CIF has raised over $100,000 by running for possibilities. 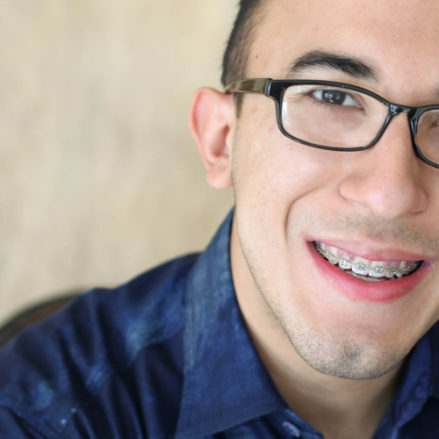 When you join Team CIF, you’ll become part of a community that values all dreams and will provide you with one-on-one support along your path toward a dream of your own. 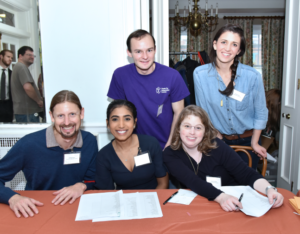 During your weeks of fundraising and training, you’ll engage with our dedicated staff, meet Center for Independent Futures community members, and see the difference your efforts are making. To read more about the benefits of being a Team CIF runner, click here. The 2018 Bank of America Chicago Marathon is Sunday, October 7. Registration is open now, and guaranteed entry spots are limited. Contact Elizabeth Male today at (847) 328-2044 or emale@independentfutures.com to join Team CIF for the race of a lifetime. On Sunday, October 8, eight runners representing Team CIF took the 26.2 mile journey from the start to the finish line of the Bank of America Chicago Marathon. Every step of their route supported the journeys individuals with disabilities take along the way to full, independent lives. 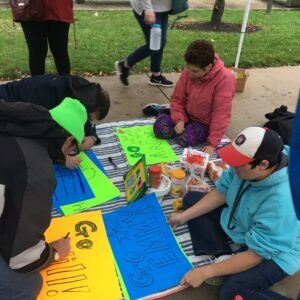 On Sunday morning, a cheering squad of participants and staff members set up a tent at the marathon’s Charity Block Party. As the runners ran by at mile 14, the group kept their energy up with their encouragement. Despite the heat, all eight Team CIF runners crossed the finish line. During their months of training for the race, our runners raised over $11,000 for Center for Independent Futures. Celebrate the team’s success by visiting their Crowdrise page here and clicking on the red button on the right that says “Donate to this fundraiser,” or donate to an individual runner by clicking on the names at the bottom of the page. Team CIF will be back at the Bank of America Chicago Marathon on October 7, 2018. 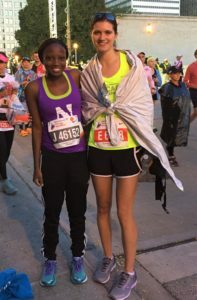 If you or anyone you know would like to achieve the dream of running a marathon while helping others reach their own dreams, contact Elizabeth at (847) 328-2044 or emale@independentfutures.com. Registration opens on October 24, and spots are limited, so call or email today to guarantee your entry into this incredible event!